Such a huge loss this morning. Anthony Bourdain’s suicide has hit home for me too. My thoughts go out to his friends & family. Living with depression is hard. I’ve been living with ugly thoughts since before I knew what depression was. It comes and it goes, isolating blackness that pulls me out of life without my consent. I just want to be happy and I marvel at those who seem to be comfortable in their skin. I’VE been that happy person, at times. And then I’m not again. 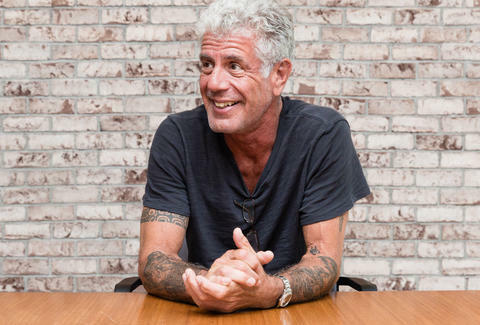 Tony’s work exposed me to things I love deeply: cooking, great storytelling, travel, adventure. If I could name a hero to look up to, I’d name Anthony Bourdain. He’s shown us how sharing a meal can unite the world; crossing differences near and far – it doesn’t matter. People are people, and we are kind. I’ve experienced this myself. As for me, I’m doing my best to prioritize the things that make me happy. I’m travelling as much as I can. I’m riding the heck out of my mountain bike because it makes me feel like a kid again. I’m learning to fix my bike when I break stuff (too often!). I want to be the best Dad I can be. I’m trying to be mindful that life is GOOD. And I am trying every day to keep the blackness at bay. The solution is in YOUR hands. Please try to find the things that make you happy and prioritize them. Reach out to your friends & family. They love you and you will feel their love. Begin to love yourself again. I have huge hugs and love for my family & friends. When I see you I will let you know just how much you mean to me. Unboxing Canon T5i & Free Boon-docking in Vail! VLOG 22. VANLIFE 15. A short but sweet trip through Colorado. We stopped through Denver to pick up a Canon Rebel T5i to enhance our video production. Cee makes quick work unboxing her new camera. Off to Vail where we found a great free parking spot that allowed us to overnight discreetly in our RV. Be sure to check out our Google Map below for details of where we boon-docked/camped along the way. Did you like this video? We hope so, if you did please give us a thumbs up! We’d love for you to follow along by subscribing to our email newsletter or to our YouTube channel, or both! http://adventuredorks.com/wp-content/uploads/2017/10/VLOG-21VANLIFE-15-Free-boondocking-Vail.jpg 718 1280 Christina http://adventuredorks.com/wp-content/uploads/2017/02/AdventureDorks-FA-02-1-300x139.png Christina2016-10-23 07:31:282017-02-26 00:24:37Unboxing Canon T5i & Free Boon-docking in Vail! VLOG 22. VANLIFE 15.